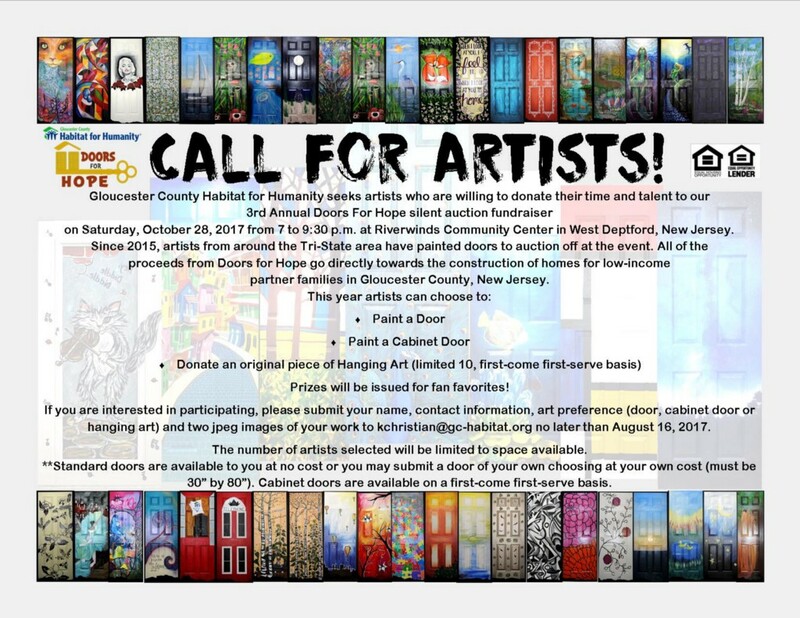 Gloucester County Habitat for Humanity seeks artists who are willing to donate their time and talent to its third annual Doors For Hope charity auction fundraiser on Saturday, Oct. 28, from 7 p.m. to 9:30 p.m. at Riverwinds Community Center in West Deptford. Since 2015, artists from around the tri-state area have painted doors to auction off at this unique and colorful event. This year, world-renown artist Isaiah Zagar — best known for his mosaic murals on South Street and the Philadelphia Magic Gardens — has signed on as one of the artists. “What’s great about Doors for Hope, and any event we do, is 100 percent of the proceeds go directly to the construction of our partner family homes,” said Ketty Christian, events and fundraising director, Gloucester County Habitat for Humanity and former partner family. “Our construction team is entirely made up of volunteers, which gives us the ability to put every penny into the materials and the equipment to build our homes. Artists can paint a door, paint a cabinet door, donate an original piece of hanging art or do all three. The cabinet door and hanging art options have limited space, so artists should contact the affiliate as soon as possible to sign up. Anyone interested in participating must submit their name, contact information, art preference (door, cabinet door or hanging art) and two jpeg images of their artwork to kchristian@gc-habitat.org no later than August 16. The number of artists selected will be limited to space available. Standard doors are available to the artists at no cost, or they may submit a door of their own choosing at their own cost (must be 30 inches by 80 inches). Cabinet doors are available on a first-come, first-served basis. Gloucester County Habitat for Humanity is a community-driven nonprofit organization that develops working partnerships with local businesses, churches, community groups and other individuals to successfully tackle a significant social problem — the lack of affordable, safe and decent housing for all. To learn more, visit: gc-habitat.org.